We’re quickly moving towards wintertime here in New England, and with that comes earlier sundowns and less favorable daytime light. I am struggling with pictures, trying to get tasty shots with what light we have. Although I do have lights and whatnot for shooting photos at night, I have ever been particularly comfortable using them. But, maybe I need to. What do you think? I just hope the photo does this dish justice. Although I usually roast vegetables for the speed and flavor of the method, this weekend, I wanted to take things a little slower to let the flavors develop more. As a point of reference, when you have an opportunity to do that, it’s totally worthwhile. It all started with the radishes — the lovely bunch that came in our final CSA box last week. And knowing how delicious radishes are when cooked, I wanted to roast them badly. I scoured the cabinets for what to add to them — fingerling potatoes from a week ago, a spare sweet onion, some red wine … and then I did it. And the resulting dish was so good that I didn’t want to share (but of course, I did). 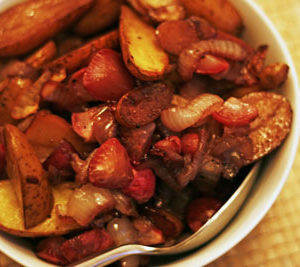 When eating this, try to stab a bit of the sweet, sweet onion with the sharp radishes and the creamy potatoes. It’s pure bliss. Maybe that’s why I had to have seconds and thirds (and why Will and Paige attacked their portions with ferocity). Preheat the oven to 325 degrees. Line a baking sheet with nonstick aluminum foil. 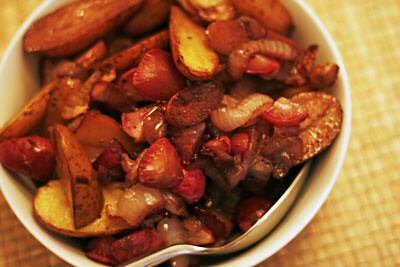 Combine the onion, potatoes and radishes on the baking sheet. Toss with olive oil and salt and pepper. Slide into the oven and bake for 45 minutes, stirring occasionally. Drizzle the wine over the vegetables and toss to combine. Bake for an additional 25-35 minutes, until the vegetables are golden (especially at the edges). Roasted vegetables are a hit at our house, too! They are so easy and yes delicious. Thank you for the idea to roast the radishes! I had run out of creative ideas for what to do with them, since I’ve also been getting them from my CSA. The flavor was absolutely delicious. I think it’s the only way I want to eat them now!